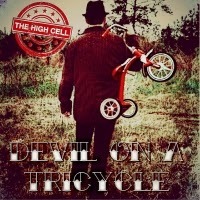 Michael Heisel aka The High Cell presents his latest release, The Devil on a Tricycle EP. The High Cell is a very interesting project, mainly because it is the brainchild of one man, Michael Heisel, and for the most part, his new EP is entirely a product of his own execution. The Devil on a Tricycle EP also features a couple of guest musicians, Davy Knowles on guitar and Adam Berzowski on keys. The overall sound of the album is a blend of blues, rock, funk that sounds like it could have been born in an imaginary town halfway between Cleveland, Ohio and New Orleans, Lousiana. (That wouldn't put you too far from Memphis, Tennessee, which fits the bill pretty well, too.) The production value is so good that it speaks volumes about Heisel's multi-hat wearing prowess as he also was behind the recording of the EP. The first song on the album, "Another Fine Mess," is one of the more "straight rock" songs on the EP. By that I mean the rest of the album has a lot of influences from blues and funk layered on solid rock foundations. This track fits pretty well into the classic rock genre. The main guitar lick is very reminiscent of Roy Orbison's "Pretty Woman" but the rest of the song sounds a bit more like modern southern rock from the likes of Gov't Mule. Heisel's vocal timbre is an excellent fit for this gritty, riff-dominant style of rock. There is a fantastic solo from Davy Knowles that really slants the song in the blues direction, but it still comes back home at the end. The main chorus is simple and effective and serves very well as a hook that will keep this song in your head for a while to come. The title track, "Devil on a Tricycle," really got my head nodding. A laid back, in-the-cut beat worthy of The Meters kicks the song off into a classic blues progression. The bass line is thick and funky, driving the beat forward. The guitar is plucky and twangy at the same time making me feel like I'm in New Orleans. The imagery of the lyrics is pretty hilarious and plays into a great metaphor. The bell on the tricycle is the bane of the singer's existence. It's that one little thing that just drives you crazy and this track puts a name on it. "Tread" is another track that brings in a guest musician with Adam Berzowski on organ duties. Berzowski rips up a lively solo early in the track which really raises the energy of the composition. The song is a slow, blues romp that sounds like it could have been written and/or performed by a psychedelic rock outfit of the seventies. We also get to hear Heisel's harmonica skills on "Tread" followed directly by a wailing guitar solo. The execution on this track is flawless, but it's not my favorite track on the EP just because it's a bit slow and starts to drag some with a play time of 4:29. Moving into a more North Mississippi brand of the blues, "Small Town Bird" picks up the pace. The song sounds like something Luther Dickinson might write with a stomp worthy blues backbeat and heavy blues riffs driving the progression. The large layers of vocals create an excellent lead part for one of the most well composed songs on the album. The lyrics on "Small Town Bird" bring a very strong and catchy chorus. Heisel does a great job of taking a simple metaphor and turning it into a multi-layered narrative. He does this most effectively on "Small Town Bird" while perfectly pairing this narrative with roadhouse style of blues. "Rise," the final track on the EP, takes us back toward riff rock, but this track is much funkier than the likes of "Another Fine Mess." Putting the pentatonic scale to one it's best uses, "Rise" plays back and forth between a funky riff and vibing through a blues progression for dynamic play on a very familiar song structure. The short bridge with layers of harmonies singing "riiiiiiiise" is a nice breakdown to the composition, giving some breathing room to the overall flow of the song. The Devil on a Tricycle EP is available for purchase through iTunes, Amazon, and most major digital music retailers.